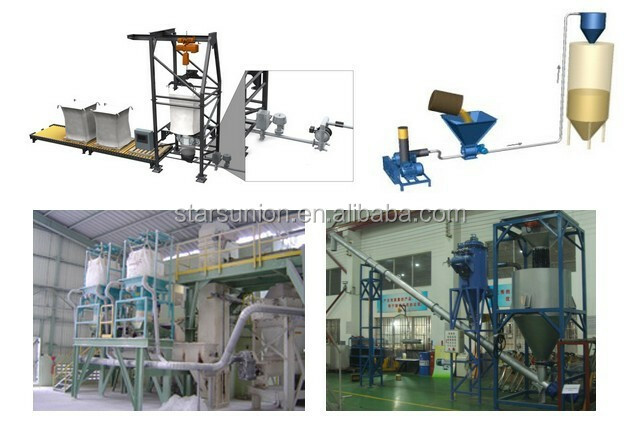 Jumbo Bag Station is used for ton bag prducts unloading operation workstation powder and granular materials. 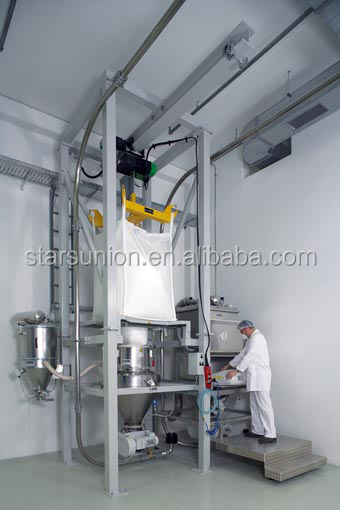 Ton bag down bag standing used plastic, food industry and other industries, the bags, such as all kinds of additives, lime powder and PVC powder and other dry prducts unloading operations of powdery and granular materials. 1) Construction material: Carbon steel, 304 L / 316 L stainless steel. 2) Available with de-dusting filter or equipped for centralised dust suction. 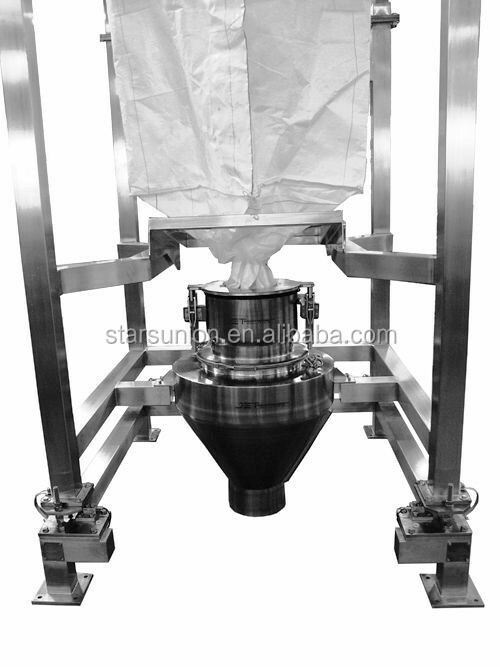 3) Filter element options: cartridges, round bags, elliptical bags. 4) Filter surface from 2 to 25㎡ . 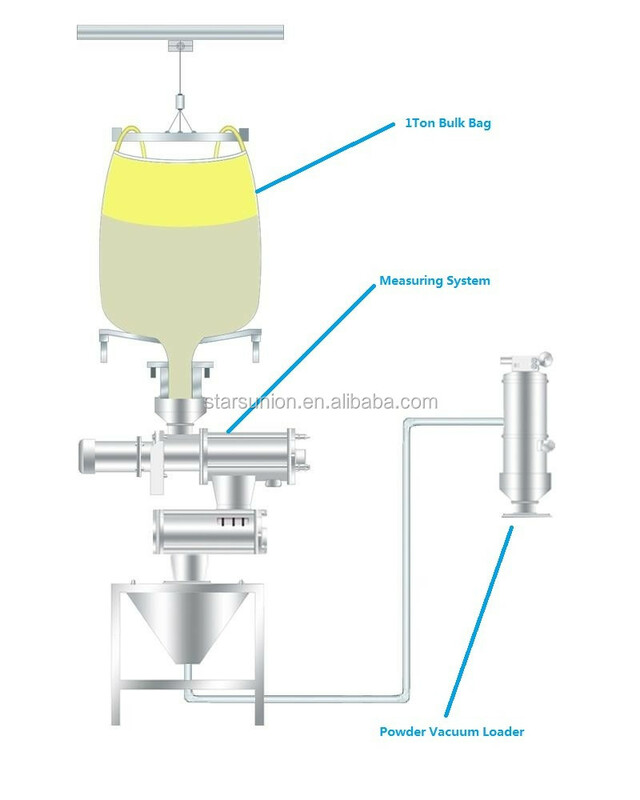 5) Collecting hoppers with different capacity volumes from 2 to 25m³ . 6) Support feet with possibility of height adjustment for fit the operater. 7) Available in ATEX version, zone 22. 8) Space-saving overall dimensions and compact user-oriented design. Bag lifer for jumbo bag hang on. To push bag discharge quickly and improve the unloading speed. 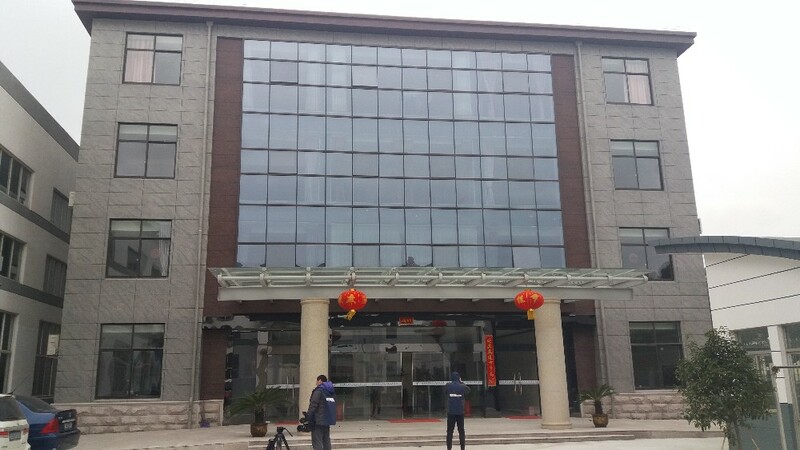 Our factory principle: high-quality products and leading service. Q: Are you trading company or manufacturer ? Why we choose StarsPlas? A: StarsPlas is a Factory-Outlet Platform for excellent manufacturers only! Easy Rule: All price was markable by factories directly, StarsPlas take commissioin just like sales depart. Professional: StarsPlas can help to match with manufactures, save lots of time and avoid risk for you. 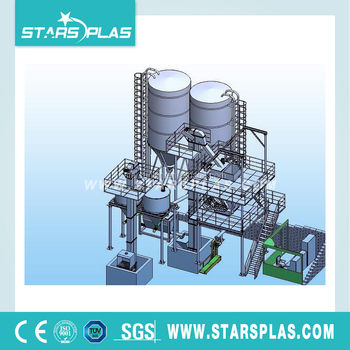 Quality Guarantee: StarsPlas is cooperated with ZJG Plastic and Packaging Machinery Association. Only qualified manufactories will be present to you! Service Overseas: A Union Service Team of StarsPlas is always standing by there. StarsPlas is open Platform and would like to share all with you and welcome to visit us ! Q: How long is your delivery time? Do you have on site service? A: 3~15 days if the goods were in stock. And 30-60 days if no stocking or customized. Our service team can go to worldwide for all equipment installation and commissioning. Q: Do you provide samples testing ? is it free or extra ? A: Yes, we could offer the sample testing for free charge but do not pay the cost of freight. Q: What is your terms of payment ? Is it safe for us? A: 30% T/T in advance ,balance before shippment. L/C is acceptable.